Dates can be awkward, boring or predictable if done improperly or with someone you don't know very well. On the flip side, dates can be fun, romantic and unforgettable when they are well-executed. Romantic date ideas can consist of attending a bonfire on the beach, creating a theme night, going for a night on the town or simply staying in. Remember, whenever you and your partner share an activity you both enjoy, the date is bound to be romantic. 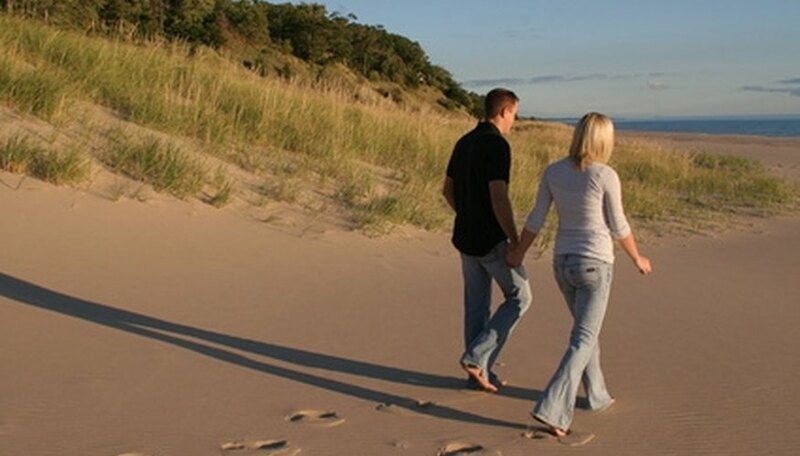 If you prefer a laid-back activity, take your date for a romantic stroll on the beach. While it's no secret that walks along the beach are romantic, a beach bonfire date can have it all. Find a beach in your area that allows fires or has fire pits. Select a time later in the evening to go and bring a picnic blanket and basket packed with your favorite appetizers. Open a bottle of champagne or your favorite drink and watch the sunset together. When the sun has gone down, the two of you can share a blanket and stare at the fire. Don't forget to bring marshmallows! Themed events make for fun and creative date nights. Find a local movie theatre or drive-in that plays old Hollywood movies and ask your mate to dress up in 1950s style. Women could wear pin-curls, poodle skirts and button-down sweaters while men could wear brown slacks and polo shirts. The man should be a gentleman all night, opening car doors and paying the cost of the movie. Finish or even begin your night with dinner at an old-style diner where you order burgers and a milkshake to share. Sometimes being romantic doesn't mean going "all-out." If the idea of romance for you and your date is snuggling under a blanket and reading together, sharing a bath or spending all night practicing your smooching, then, by all means, do it. Add some romantic ambiance to your night in by filling the room with candles or lighting a fire. Another way to spend a night in is cooking your favorite meal together. Cooking together can be fun and even funny if one or both of you are not kitchen-inclined. Cook up a pizza or some pasta together, and line your table with candles. Cap the night off with a glass of wine. Sometimes playing tourist for the day can be fun. Pick up your date and take her to a fancy French restaurant. Afterwards, go for a horse-and-carriage ride and take a tour of your city. Finish your night by stargazing together on a blanket at your local park or even in your back yard. Are you and your significant other risk-takers? If so, capitalize on that zest for life and arrange something completely unforgettable for your date such as scuba-diving or swimming in a shark cage. Alternatively, you could go hang gliding, bungee jumping or rock climbing, or take a ride in a hot air balloon. Pettinato, Minot. "Ideas for Romantic Dating Activities." Dating Tips - Match.com, https://datingtips.match.com/ideas-romantic-dating-activities-7893358.html. Accessed 18 April 2019.